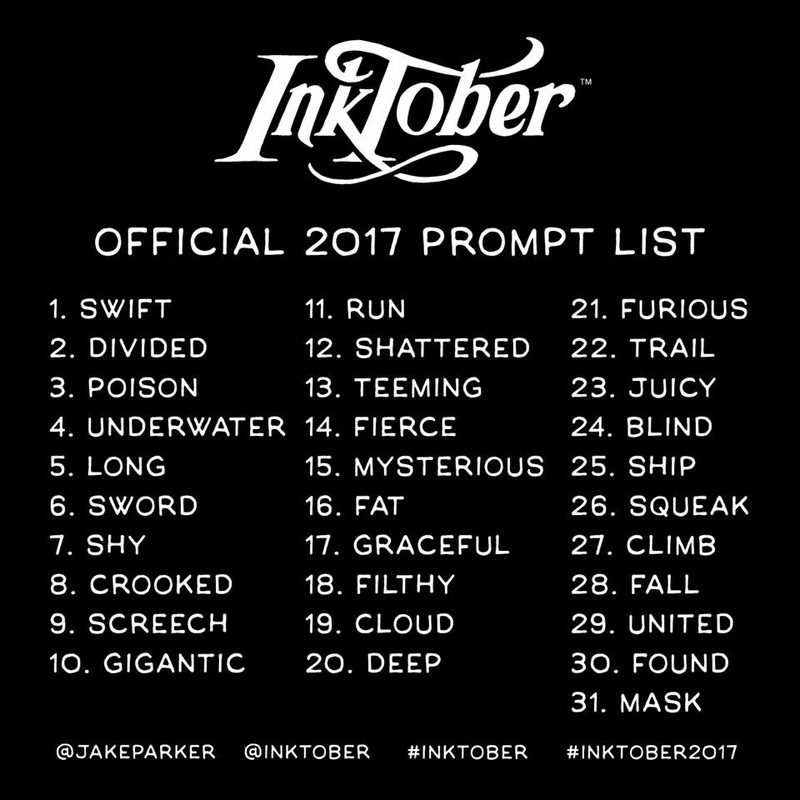 I’m doing Inktober again and I like it. It was fun last year. I’m rather pleased with what I did thus far. I have the impression I have progressed. It takes me 2 to 3 hours every night, depending on how long I need to find my subject, then I focus without interruption till I’m done and realise my coffee is cold, I have not smoked and I’ve done something pretty. Day 1: ‘swift’. Drawing of a swordsman wielding a Japanese sword. Black ink Uni-ball pin pen (0.05 mm), and grey soft brush Pitt Artist Pen. Day 2: ‘divided’. 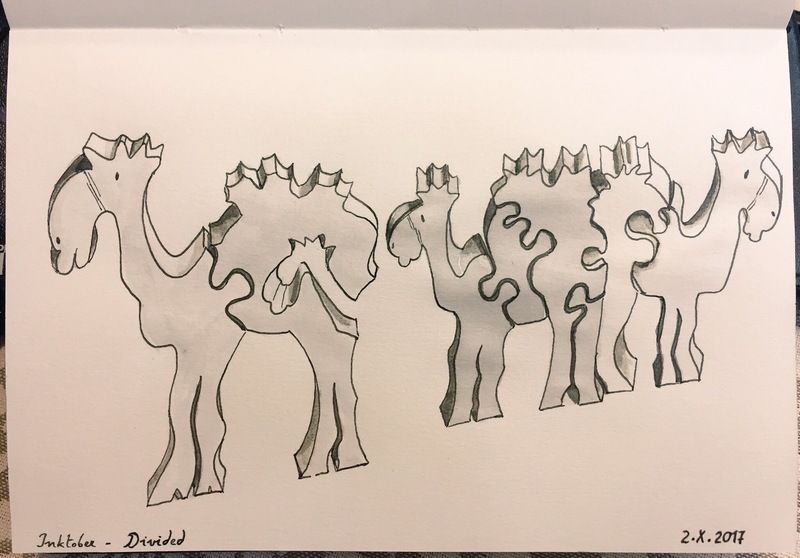 Wooden jigsaw puzzle of three camels, one separated from the others and slightly behind. Black ink Uni-ball pin pen (0.05 mm), and grey soft brush Pitt Artist Pen. Day 3: ‘poison’. 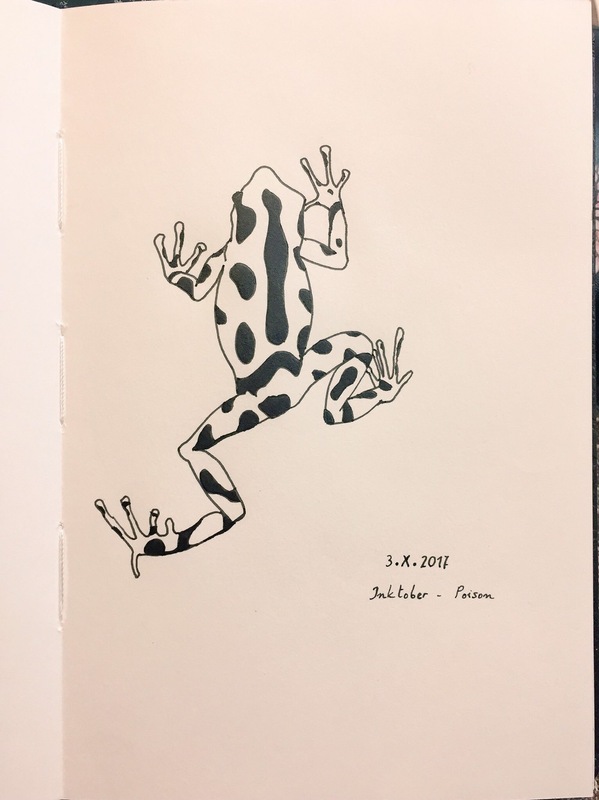 Poisonous frog viewed from above, in black and white, with black spots. In real-life, these are green and black. Black ink Uni-ball pin pen (0.05 mm). 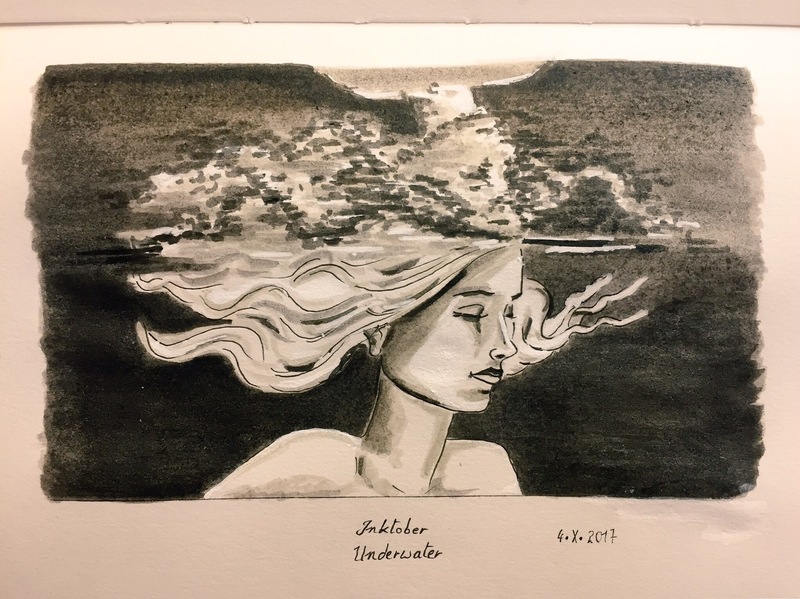 Day 4: ‘underwater’. Still woman immersed, the top of her head breaking the water. Black ink Uni-ball pin pen (0.05 mm), and grey soft brush Pitt Artist Pen. 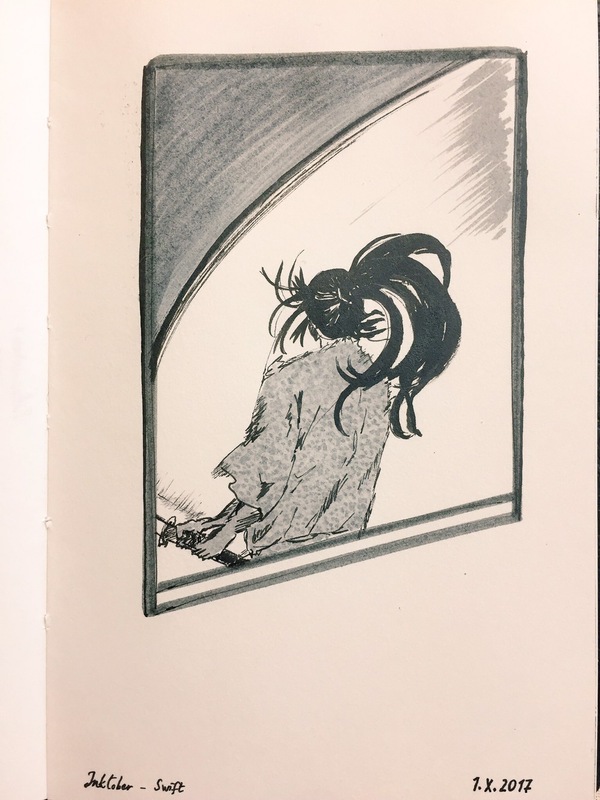 Day 5: ‘(so) long’. 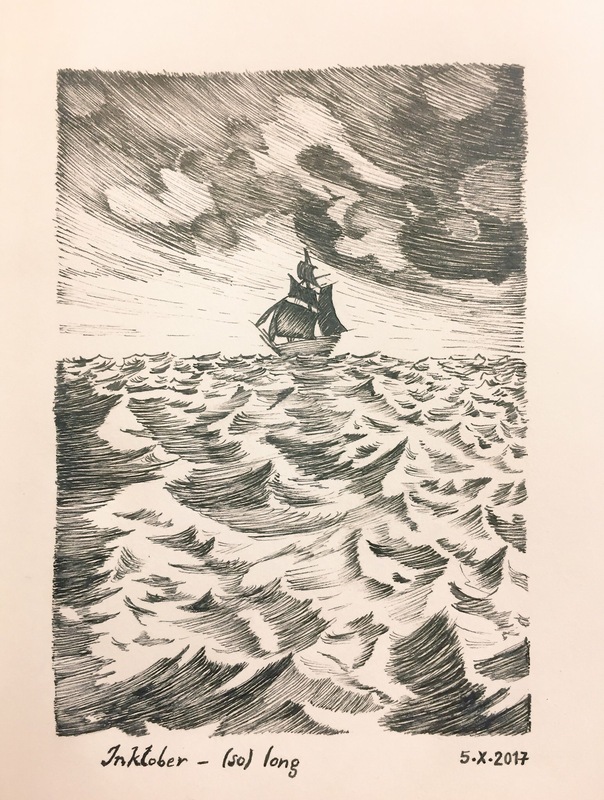 A sailing ship at sea, far away on the horizon, big waves in the foreground, and cloudy heavy sky. Copy of work by Bernie Wrightson, who was much much gifted than I am. Still I quite like my work. Black ink Uni-ball pin pen (0.05 mm). i love the way you’ve interpreted the prompts.